A quick view of the most influential metrics in San Diego. The city of San Diego, California lies along the coast of Southern California and is the eighth largest city in the United States and the second largest in the state. The city is also known as "America's Finest City" and lives by the motto "Semper Vigilans" meaning ever vigilant. The city is located in San Diego County and spans 372.4 square miles, with 47.21 square miles being water covered. The city consists of 52 recognized planning areas which are then broken down into over 100 distinct neighborhoods. The city has a strong mayor from of government, meaning mayor is given almost complete administrative authority though budgeting issues still must have council approval. The city is the county seat of San Diego County and a principal city of the San Diego-Tijuana metropolitan area. The city enjoys a wonderful Mediterranean climate with warm dry summers and mild winters and on very rare occasions snow. The original inhabitants of the area were natives of the San Dieguito, La Jolla and Kumeyaay people. The first Europeans to the area were Juan Rodriguez Cabrillo and his crew, from New Spain, sailing under the Castile flag in the early 1540s. In May of 1769, the area came under the control of Gaspar de Portola who established the Presidio of San Diego, a fort and the first settlement by Europeans in the state and was officially established in July of that year. In 1821, Mexico won its independence and San Diego became a part of the Mexican state of Alta California. A short time later United States went to war against Mexico, when the war ended in 1848 Alta California became a U.S. territory and in 1850 became an official state. On March 27th of 1850 the city was officially incorporated. According to the United States Census of 2010, San Diego was home to 1,307,402 spread across a 372.1 square mile area giving the city a population density of 3,771.9 people per square mile. In 2000, the median household income in the city was $45,733 and the median family income was $53,060. The largest factors in local economy are military/defense, tourism, trade, research and manufacturing. According to the City's 2013 Comprehensive Annual Financial Report the top five employers in the city are the United States Navy, the University of California-San Diego, Sharp Healthcare, San Diego County and the San Diego Unified School District. The city is home to a wide range of attractions and must see venues, like over 70 miles of beaches, popular surf spots, the San Diego Zoo, LEGOLAND California, unique shopping experiences, golf courses, spas and more. There are cultural sites and events like the San Diego Museum of Art, the San Diego Museum of Natural History, the symphony and a variety of annual festivals and events. 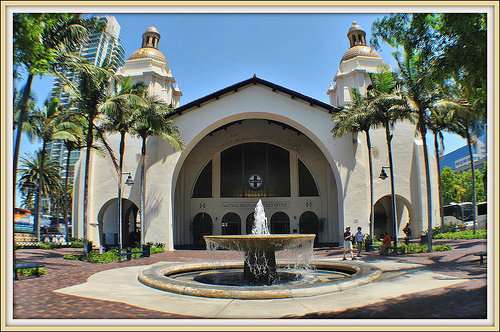 There are many well-known neighborhoods like Downtown, La Jolla, Pacific Beach, Normal Heights and North Park. Housing in San Diego ranges from small starter homes up through sprawling estates. Other real estate options include apartments, houses and multi-family structures for rent as well as condominiums and town homes for sale or lease. Local real estate agents are best equipped to help you explore your options in the thriving metropolis of San Diego. View our selection of available properties in the San Diego area. Check out the latest demographic information available for San Diego. Learn more about schools near San Diego complete with ratings and contact information. Browse through the top rated businesses in the most popular categories San Diego has to offer.